UK Single - 3ft x 6'3"
UK Double - 4ft 6" x 6ft 3"
UK King - 5ft x 6ft 6"
UK Super King - 6ft x 6ft 6"
Our collection of premium bedding sets are sure to fit the bill if you are looking for premium quality duvet covers, pillowcases, sheets and more. We know that your bedroom can be the most important room in your home and it is important that where you sleep is as comfortable as possible. Our collection comes in a range of colours and materials and various qualities of cotton including 1000 thread count sheets. 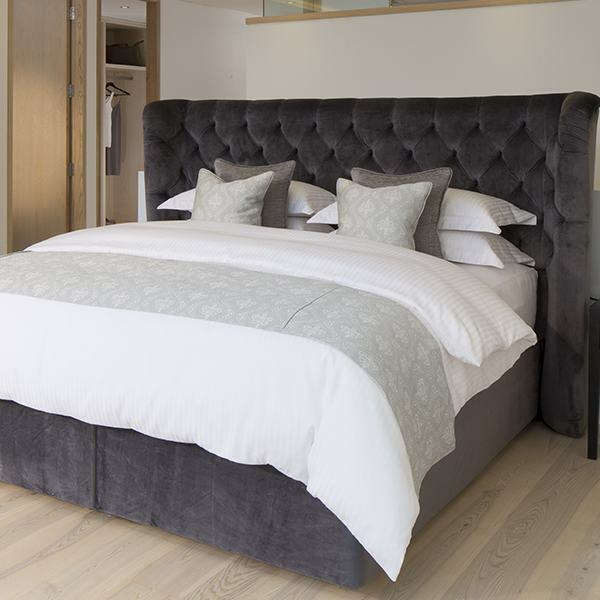 We also know that not every bed has the same measurements which is why we have a team of, in-house, expert, seamstresses who are ready to customise your order to make sure your new, premium, sheets are as well fitting as possible.This, combined with the quality design, leaves your bed looking neat and beautiful. We also supply many brands of designer bedding, in case you like the style and designs from a specific manufacturer. Not only can you purchase sheets from our beautiful collection you can also view our bedroom accessories such as headboards, valances and cushions which will ensure that your bed remains all in the same style. All of our orders are subject to our fantastic levels of customer service and if you are unsure on what fabric to go for you can view our buying guide which highlights the pros and cons of each fabric to help you make a decision. Bedding Set - Alice DesignBeautiful 9 Piece Bedding Set with floral bed runner & fox cushions400..
Grey Bowden Bedding SetLuxury 5 Piece Bed Set, bespoke made by Victoria LinenBeautiful duvet cover a..
Arley Bedding SetNew bed set in bright citrus coloursGive your bedroom a wash of colour with our stu..
Primrose Bedding SetLuxury Bedding Set in 400 Thread Count Cotton with Genevieve Cushions and Bedspr.. Satin Stripe Bedding Set - 100% Cotton Set with CushionsStylish bed set with duvet cover, contrast s..
Bedding Set in 1000 Thread Count Cotton. Luxury thread count bedding with a sateen finish. Man..
UK Made Luxury Bedding Set. 400 or 1000 thread count cotton sheet, duvet cover and pillow case.. Luxury Bedding Set in Bowland Check. 400 or 1000 thread count Duvet set and pillow cases compl.. Luxury bed set in Earlston. High thread count sheet and duvet set. Modern prints adorn the&nbs..
UK Made Luxury Bed Set. 400 or 1000 thread count cotton sheet, duvet cover and pillow case. &n.. Stunning bedding set in Florence. Delicate stripes and cute little stars adorn the accompanying.. Luxury Bed Set - Opulence400 or 1000 thread count cotton sheet, duvet cover and pillow case. F.. Single Duvet Cover Set in Satin Stripe IvoryIdeal for longer single beds, or for taller people!135 x..